Byron stressed, “My relationship is very personal.” He commented that corporate worship has its place, but standing before the throne he’ll have to stand alone. He says he lives his life in a righteous way, trying to walk according to what God desires of him. He prides himself on not allowing anybody else’s relationship to influence his beliefs or relationship with God. Renee: How has winning 4 Stellar Awards impacted your life? Byron says that he thanks God for awards and that they have been a tremendous blessing. The awards are allowing him to do other things including movies. He feels that wherever the Lord takes him, as long as he can take the name of Jesus with him, he wants to go. Byron recognizes that there are people who may feel Christians shouldn’t go on the secular side, but as he puts it, “Who else is going to reach the lost?” For this reason Byron is not afraid of being criticized for reaching out beyond the boundaries of gospel music. Renee: Who are you desiring to reach with your ministry? Byron: Anybody who loves Jesus or is trying to get to know Jesus in a more personal way. It’s important to show people the Bible is true when it says God inhabits the praise of His people. So, unless you enter into His praise, God won’t inhabit your space. People think just going to church is enough. Even though corporate worship is good, we have to worship God privately. So, people who want to worship are the people Byron desires to reach. Renee: Who are your favorite gospel artists? But of course Byron has some Detroit favorites. He mentioned the late Thomas Whitfield (“The Maestro”) as one of his mentors who taught him everything he knows about praise and worship. “I would love to do half of what Thomas did in God’s presence.” But, Byron says his favorite person of all time living in Detroit is pastor Marvin Winans because he loves preachers who are anointed, love music ministry, and preach the Ramah word life. Also, running neck and neck for Byron’s favorite Detroit female artist are Karen Clark Sheard and Dorinda Clark Cole. He does lean a little more towards Karen because they have worked together on several occasions including doing area plays. Renee: Who are your influences? Byron: I have many influences. Along with Thomas Whitfield, Fred Hammond has had an influence on me. Byron recalls that he had the privilege of growing up with Fred Hammond when Fred was the bass player at Greater Grace Temple in Detroit and Byron was the choir director. The gospel group Commission (known at the time as the Disciples for Christ) asked Byron to be a part of the group, but Byron was attending Oakland University at the time and his mother convinced him that music will always be there, so he should finish school. Byron acknowledges that Fred Hammond is the writer, producer and singer of our time and is an incredible influence on his music ministry. Byron says Detroit is the Mecca for gospel music and was a good foundation for his music ministry. Growing up in the era of Charles Knicks and the St. James Choir, Donald Vails, Mattie Moss Clark, and the Clark Sisters left a lasting impression on young Byron. Byron left Detroit when he received a scholarship to Moorehouse College in Atlanta. While living in Atlanta, he became the minister of music for Bishop Eddie Long under whose pastorage he remained for 10 years. Renee: Can you give any advice to aspiring artists? Byron: You really have to know the Lord. Byron stresses that it is important to have a personal relationship with the Lord, so you’re not shaken when doors are closed in your face. “I’ve had many, many, many, many, doors closed in my face because people didn’t believe in my gifts and talents.” “But, God’s anointing will supercede anything”. “You just have to walk accordingly and be faithful to a ministry.” Byron mentions how he has always remained committed to his pastor and loyal to his church in whatever city he has lived. He doesn’t believe in being a church hopper. Byron says his experience growing up in Detroit has shaped what he would become in 2003/2004. “Thank you detroit for your prayers, support and embrace.” Byron quotes Larry Robinson as saying that he can’t keep Byron’s project in his store (God’s World on W. 7-Mile in Detroit). After a little coaching, Byron expressed his love for Detroit Gospel.com, his favorite gospel Internet site. “God is good,” says Byron in closing. Background: Byron was born and spent his early years in Grand Rapids, Michigan, and attended church under Bishop Abney. When he was12, his family moved to Detroit, where he joined Greater Grace Temple under the pastorage of the late Bishop David Ellis. At the age of 23, Byron moved to Atlanta to attend Moorehouse University on a scholarship. It was during this time that he joined Bishop Eddie Long’s church where he remained for 10 years. Byron is currently minister of music at Ebenezer A.M.E. Church in Fort Washington, Maryland, where the pastor is Rev Browning. Ebenezer is one of the largest A.M.E. churches in the D.C. area and Byron has been an active member for the past 6 1/2 years. Closing: We pray God’s continued blessings for Byron and his family. 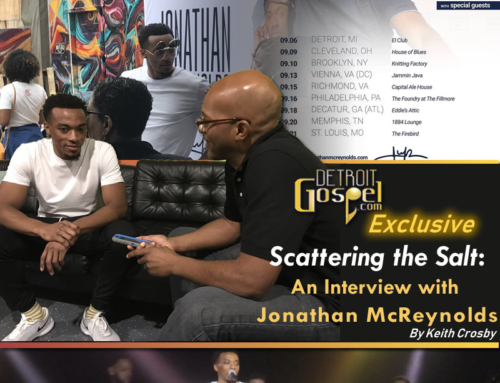 Detroit Gospel.com loves and appreciates Byron for taking the time out of his very busy schedule to talk with us. Byron, we thank you soooo much!!!! 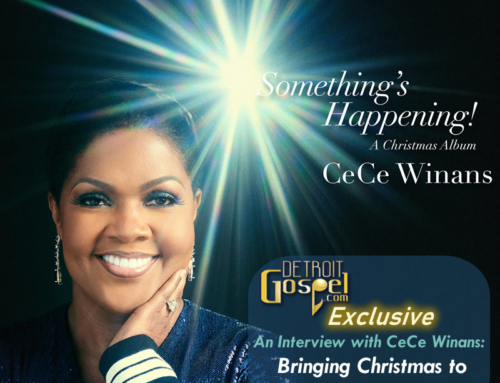 We truly thank Byron for his graciousness and willingness to share his ministry with Detroit Gospel.com. We also thank Renee’ for painstakingly transcribing the interview and giving us this insightful write-up. To Our Readers: If you ever get the opportunity to experience Byron Cage’s tremendous music ministry first hand, grab it! God’s anointing on Byron’s ministry is so powerful and so REAL. Byron’s music ministry transcends notes, scales, and rhythms and truly ushers the worshipper to the Throne of Grace as the glory of God fills the Temple. Congratulations to Byron and Sonya Cage from Detroit Gospel.com!